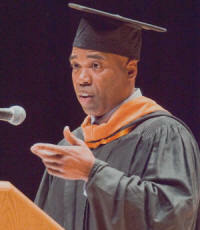 It is indeed an honor and a privilege for me to address you, the 2010 class of the L.C. Smith College of Engineering and Computer Science at Syracuse University. I’d like to thank Chancellor Nancy Cantor, Dean Laura J. Steinberg, Jenifer Breyer in the development office, and all the faculty and staff for this tremendous opportunity. I graduated with a degree in electrical engineering in 1984. I started my career in Pennsylvania with General Electric, testing components of the Global Positioning Satellites that would later serve the navigation systems that are so common in cars and phones today. I’ve helped design wide area networks for Grumman Corporation in Long Island, New York, and for Pratt & Whitney in West Palm Beach, Florida. I’ve worked on Wall Street, deploying applications for Goldman Sachs in cities that included Hong Kong, London, and Tokyo. My career has spanned defense, consulting, and the financial services industries. Today, I run my own Web-based company out of my home, where I sell advertising services to authors and book publishers. It has been a terrific ride so far, and I have never been happier. I can say without reservation that my career and experiences were a direct result of my education and experiences here at LCS. I was prepared in ways that I would not fully appreciate until many years later. In reality, each and every one of us was fully capable of completing our degree. The admission process pretty much ensured we had the ability to complete the coursework. What would separate those who completed the program from those who did not was a single variable: effort. One’s willingness to engage in a focused series of tasks over a prolonged period of time despite inevitable setbacks and obstacles is perhaps the best predictor for completing the rigorous and world-class engineering program here at Syracuse University. Effort, however, like energy, is a scalar quantity. It defines magnitude, not direction. One could expend vast quantities of energy on campus and not graduate. Back when the legal drinking age was 18, I knew quite a few people whose effort in alcohol consumption was sufficient to earn a Ph.D. Unless things have changed radically since I graduated, our school of engineering does not confer degrees in drinking. Those students ultimately became some of the jokers on my left and right. Actually, I was almost one of those jokers myself. The engineering program was quite difficult for me. I remember getting a 16—yes, out of 100—on my first physics test. Graded on a curve, it was a passing grade. But for someone accustomed to getting good grades with little effort, a 16 was shocking. Before then, I’d prided myself on my record of scoring higher than my age on exams. I’m sure I went through all the initial stages of grief: denial, anger, depression…. Ultimately, I had to get over the shock and recognize that if I were going to make it out of this program, more effort would be required than I was currently expending. A couple of years later, electromagnetics provided a refresher course in that lesson. Another valuable lesson I learned is that the best efforts are collaborative. The best ideas, designs, and implementations are typically the result of collaborative efforts. All those harrowing group projects, with assigned partners, were not just about learning the material but learning how to work effectively toward a common goal with others. The study groups we formed to solve problem sets helped in the learning process. The ability to work with others will come in handy in more ways than you can image. Now that I think about, some of the advice I’ll relate to you this afternoon came from a Facebook post I made on Thursday night, asking my friends what information they thought would be important for me to relate to a class of graduating engineers. In less than 24 hours, I’d received more than 60 comments from people on my Wall and through direct messages. Just Google “Troy Johnson Facebook.” I should be the first result, and you can read some of the comments on my Wall from May 13. Some of the comments were quite profound, and some were very funny (as you can tell, I’m just using the profound comments in this speech). While our own individual efforts are critical for success, we cannot forget the efforts of those who have and continue to support us: our parents, professors, friends, and classmates. Actually, it is a good idea to occasionally thank those who have expended the energy to support and aid us along the way. Similarly, be sure you use some of your energy to help others. You’ll find your efforts to help others will actually help you in the long run. The reason you are sitting here today is that you had the ability and you chose to generate the effort necessary to complete the requirements for your degree. You have just completed a huge accomplishment, perhaps the most impressive one in your lives thus far. But this degree is not the end; it is just the beginning. When I graduated in 1984, I told myself I was done with school. I did not think I had the stamina to apply myself the way I did in the previous four years. However, nine short years later, I earned two graduate degrees: one in information systems engineering and an MBA. What changed? First, I quickly learned one sure-fire way to become stagnant and a target for layoff in the corporate world is to fail to develop new skills. Second, while I struggled to finish the engineering program here, the end result was that I’d actually acquired some knowledge and skills, and, most notably, improved study habits. Earning those two master’s degrees was a relative cakewalk compared to my undergraduate degree. Those advanced degrees, however, gave me the ability to really choose where I would work and what I would do. Again, the foundation for all of this was my SU engineering degree. Effort without direction, or in the wrong direction, is wasted. Over the past quarter century, I learned three things that you must invest effort in pursuing. Your time will never be wasted and you’ll be better off as a result. The first is Never Stop Learning. The world is constantly changing. When I sat in your seat, I could not have possibly conceived of the business I run now. There were no personal computers. The first commercial Web sites were almost a full decade away. In 1992, while working on my MBA, I started a sideline business where I assembled and sold customized personal computers. This interest was actually sparked during a work-study job I had while at Syracuse: I used to repair the old line printers and the network terminals. In 1994, I decided to build a Web site to help promote my PC business. I was willing to learn how to code in HTML, without the benefit of a WYSIWYG editor, which weren't available anyway. I did this on my own time, while working on Wall Street and raising two young children. Fortunately, HTML came easy for me because it was similar to the early word processing software I learned right here in Link Hall almost 10 years earlier. My PC sales business then morphed into one where I created Web sites for other businesses. One of my clients liked her Web site, but she was dismayed because it was not generating any sales. I decided to create a Web site to learn how to generate sales so that I might better advice my clients. I decided to create a Web site to sell books and AALBC.com was born. That was 13 years ago and it is now my livelihood. “Unless you are getting your news from nine different sources, you are being lied to.” I don’t know whom to attribute this quote to, but I heard it many years ago, and it could not be more true than as it is today—especially with the advent of the World Wide Web. Continuous learning provides flexibility and options in one’s life. This sounds obvious, but you’d be surprised how many people neglect their health. If you do the following things, you’ll be healthier than the majority of your peers, especially as you enter middle age a couple of decades from now. Remember the phrase “moderation in all things.” Enjoy the things you like, just don’t go overboard. Don’t drink like a fish or eat like a pig. Try to get some regular exercise. Work up a sweat every now and then, ideally engaging in activities that you enjoy. In bad weather, when I can’t find anyone to play with, I run on a treadmill—thank God they all have TVs attached or else I’d go crazy. Get some sleep. The body needs time to heal and recuperate. Yes, real men need sleep, too. It is not just for old women and children anymore. Develop yourself spiritually. I’ll leave the specifics of how to do that up to you. Get regular checkups. See a doctor, gynecologist, dentist, optometrist regularly. Reduce stress. Actually, if you do everything I said after “maintain your health,” you’ll probably be able to easily cope with anything life throws your way. Finally, and this should have been first: Always Pursue Your Dreams. Effort is what we use to achieve goals—like completing our engineering degree. Goals are the steps we take toward fulfilling our dreams. Dreams, in turn, fuel our efforts. It is this self-sustaining, perpetual machine that gives our lives meaning and direction. As great an accomplishment as completing your engineering degree is, it is not a dream. It is just one step toward your dream. The degree proves to the world that you have a set of specialized skills and abilities. What you actually do with that degree in pursuit of your dreams will make all the difference in your lives. Interestingly enough, many people don’t have dreams. They have not bothered to determine what drives them, what they really love doing. They are simply going through the motions. Steve Jobs, in his 2005 commencement address at Stanford University, emphasizes this point in what one of my Facebook pals describes as the best graduation speech he has ever read. A few people, like Jobs, are fortunate to discover early on what they love to do; most of us will struggle to figure out what that is. Sometimes, we do things that we don’t particularly love while we search. And that is fine and often necessary. Just never give up the search and never settle for anything less. Often, the search for our passion is constrained by our attempts to satisfy someone else’s desire of what we should be doing. Remember, it is your life; you cannot be happy dancing to someone else’s tune. There are so many people walking around today who are in careers they do not enjoy. They may make a great wage, have a big house, and rationalize that they have an enviable job. They’ll make excuses and say they will eventually do what they love, but now is not the right time to change. If they continue down this path, they will never find their bliss. I know someone in the audience is saying, “Gee, Troy, why would anyone do something they did not enjoy doing?” I know it sounds counterintuitive, but it truly is one of life’s challenges. The first half of my career I was mainly concerned with earning a large salary. I remember thinking when I graduated, if I could earn at least $25,000 a year, I’d be content. Twenty-five thousand was what I earned right out of school. Very soon, the magic number became $50K; then $100K; at the $200K mark, I realized I really needed to focus more on what I’m doing because more money was not really making me happier. The old cliché “Love what you do and you’ll never work a day in your life” began to ring in my ears. I thought about the countless hours I spent sitting up late at night, working on my Web site. Then it dawned on me—that was my passion, building my Web site, introducing readers to books, discovering new authors, contributing something of value to the world! This was the thing that I would do if I were not being paid. That is what I look forward to doing when I wake up in the morning. This is what I would do if I was retired and did not have to go to “work”! This realization came only three years ago. I was closer to 50 than I was to 40, but it is never too late. Over the course of my life, I’ve learned that the most successful and happiest people are not the smartest, the richest, the best looking, or even the luckiest. They are the individuals willing to exert the most effort toward goals that strive toward their passions. Remember, your potential is almost always greater than you realize. Set your sights high and dream accordingly. Now look to you left and look to your right, and know that you are in the presence of potential greatness. Now go out pursue your dreams and make the world a better place in the process!